Live from New York, it’s 40 years of SNL! Here’s what’s up in the world of TV for Sunday, February 15. All times are Eastern. Saturday Night Live: 40th Anniversary Special (NBC, 8 p.m.): Live from New York, it’s just about everyone of note from Saturday Night Live’s history ever! 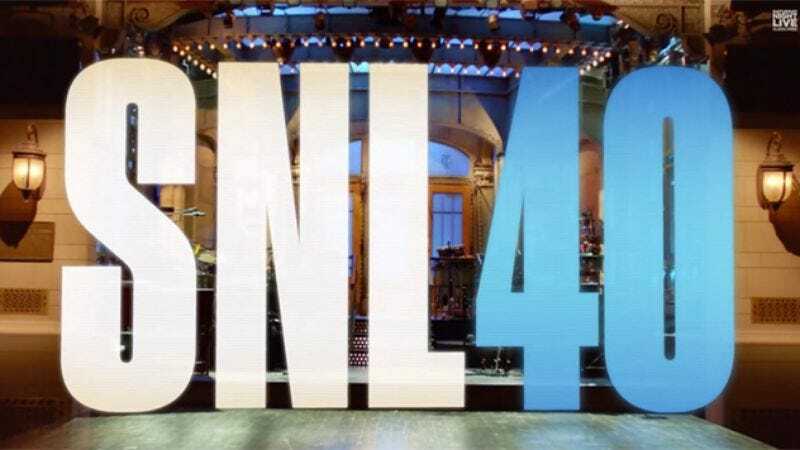 We know turning 40 can be rough, but Saturday Night Live looks to be doing it in style: Eddie Murphy, Louis C.K., Kristen Wiig, Kanye, Dan Aykroyd, Melissa McCarthy, Ludacris, Maya Rudolph, Miley Cyrus, Glenn Close, Emma Stone, Taylor Swift, Tom Hanks, Steve Martin, Poehler, Fey, Timberlake, Fallon, 50 Cent…okay, we were going to list all the guests but this thing is seriously stacked, so we’ll leave the rest to be a surprise. We’ll even be doing a livechat, so stop by during this three and a half hour long broadcast, won’t you? Saturday Night Live 40th Anniversary Red Carpet Special (NBC, 7 p.m.): Just in case you feel like watching reporters try not to piss off Chevy Chase. The Simpsons (2 p.m.): Our resident SNL reviewer Dennis Perkins is missing the anniversary special to bring you coverage of a classic Simpsons episode, so do make sure his sacrifice wasn’t in vain by checking it out. Turns out Dennis has put in his Classic Simpsons time, so some other lucky A.V. reviewer will be bringing you coverage this week. But that doesn’t mean you shouldn’t value her/his service! The Bachelor: Chris Tells All (ABC, 8 p.m.): We can’t imagine this Chris character is going to say anything we don’t already know, so let’s all just agree to watch Burning Love instead (because hi, all the seasons now on Hulu, so what are you waiting for?). NBA Special: NBA Tip-Off Presented By Autotrader.com /NBA Special: NBA All-Star Game Presented By Kia (TNT, 8:30 p.m.): We’d look into this game to write something more informed about it, but we refuse to on the grounds that we had to type out all that straight-up nonsense. CSI: Crime Scene Investigation (CBS, 9 p.m.): This is the fifteenth season finale. That is all. Watch What Happens Live (Bravo, 9 p.m.): We know there’s a lot on tonight, but we’d be slacking if we didn’t tell you about an episode of television featuring Nene Leakes and Tracee Ellis Ross. A Mighty Wind (POP, 1:30 p.m.): The Network Formerly Known As TV Guide pays tribute to Eugene Levy and Catherine O’Hara’s great history of playing delusional yet lovable couples before re-airing their new (and very funny) show, Schitt’s Creek. Wild Australia: Realm Of The Wombat (Nat Geo Wild, 9 p.m.): To quote the Internet: what a time to be alive. Constantine: We realized that we had yet to shout out Brandon Nowalk’s Constantine reviews, and that stops TODAY. And really, how could we ignore reviews that include sentences like, “He’s desiccated, and his torso bears an unusual marking that John identifies as the Devil’s brand”?